Summary In recent years, young financial engineers have used "structured finance" techniques to create a variety of high-rate, "low-risk" securities, such as collateralized debt obligations (CDOs) or credit default swaps (CDSs). The current global financial crisis is coming about because many of these "low-risk" securities are turning out to be worthless. This article explains how these faulty securities were created, and what went wrong. Over the months, I've tried to explain how things like CDOs (collateralized debt obligations) and CDSs (credit default swaps) work, but I've never put it all together in one place. I'm going to try to do it here (and hope that I get it right myself). One reason that it's hard to find a complete explanation of structured finance is that each deal is different. Apparently many of these structured finance deals were worked out in bars on the back of cocktail napkins. Thus, there's no single explanation for how a CDO is created. There are many options, but CDO creation always follows certain basic principles, rooted in Probability Theory. In particular, financial engineers use these techniques to convert low-rated, high-risk securities to high-rated, "low-risk" AAA securities. We'll use some numerical examples to show that's done, The actual "real world" CDOs and other securities will be more complex, and will combine several of these techniques. We'll describe how it's done, and how it went wrong. On this web site, I try to avoid using math, since it turns off most readers. However, in this article I'm going to give numerical examples that require understanding of some concepts like "present value" of a future payment, and "expected value" of a probabilistic payment. These terms will be explained, but the whole point of this is that you have to work through the numeric examples, step by step, if you want to understand what's going on. Most investors don't have the time or expertise to determine how risky any given investment is. So they depend on the ratings agencies to tell them how risky or safe a particular investment is. Many investing organizations have a simple rule: They will not invest in anything but AAA rated securities. The CFO of a company will say, "We manufacture widgets, and we're experts at that. We're not experts at evaluating investment risks. So we invest ONLY in the safest securities, the AAA-rates securities. Period." So if you're an investment broker and you want sell securities that aren't AAA-rated, then you've got a problem, because a lot of investors won't touch them at any price. The simplest solution is to find a way to turn lower-rated securities into AAA-rated securities, and that's where the structured finance magic comes in, as we'll see. There are three major ratings agencies -- Standard & Poor's, Moody's Investors Service and Fitch Ratings. The ratings they provide indicate the probability of default within the next year. And so, for example, if you purchase a BB bond that will pay you $1000 at maturity in a year, then there's a 5% chance that you won't receive that $1000, and a 95% chance that you will. If you're going to receive $1000 a year from now, how much is that $1000 worth today? That depends on the market interest rate. For simplicity, we'll assume throughout this article that the market interest rate is 6%. So, if I deposit $50 in a bank that pays 6% interest per year, then at the end of a year I'll have $50*(1+6%) = $50*(1.06) = $53. Now, turn the computation upside down. If I'm going to receive $1000 a year from now, then the "present value" of that $1000 is $1000/(1+6%) = $1000/(1.06) = $943.40. That's a "present value" computation for future payment. Suppose that the year is up, and I now have a bond that's going to pay me $1000 today, but it's not certain -- but there is a 5% probability of default. What's the value of that bond? There's a 95% probability that I'll receive $1000 today, and a 5% probability that I'll receive nothing. The "expected value" is: ($1000*95% + $0*5%) = $950. I know that this seems strange; after all, how can $950 be the "expected value," when you won't receive $950 under any circumstances: you'll receive either $0 or $1000, but never $950. The answer is that "expected value" is a mathematical term from the Theory of Probability. Imagine that you have an infinite number of these bonds, all being paid today. As you redeem one bond after another, some paying $0 and some paying $1000, what's the AVERAGE amount that will be paid per bond? The average is $950, the expected value. Now let's assume that I have an IOU that will pay $1000 in a year, with a 5% probability of defaulting. If I wanted to sell that IOU to someone else, what's a fair price for the IOU today? Here we have a payment in the future, and a payment that's uncertain. So we have to combine present value and expected value computations. Well, there's a 5% probability of default, and a 95% probability that $1000 will be paid, then the IOU is worth its expected value a year from now, which is $1000*95% = $950 a year from now. The present value of that $950 is $950/1.06 = $896.22. So, if I want to sell the IOU to someone, a fair price would be the present value of the expected value, or $896.22. If I wanted to make a commission, then I'd sell it for, say, $925, and earn essentially a commission of ($925-$896.22) = $28.78. I hesitate to post this example, because some people may find it confusing. But a web site reader has encouraged me to do so, and so here it is. If you want to understand how to create a collateralized debt obligation (CD0), then this example tells you how to do it. In actual practice, where there are many different ratings levels (tranches), the computations are a lot more complex, but the basics are contained in this simple example. Suppose that two people each owe me $1000. That is, I have two IOU certificates, X and Y, from two different people, each of which will pay me $1000 a year from today. However, because both of these people are unemployed, there may be a default on one or both of X and Y. I estimate that there's a 5% chance of default on each of X and Y, and in case of default I get nothing. Note from the table above that X and Y each have an S&P rating of BB (5% probability of default). The "present value" of $1000 to be paid a year from now is $1000/(1+6%) = $1000/1.06 = $943.40. However, there's only a 95% chance of being paid, so the EXPECTED value today of the present value is $1000/1.06*(95%) = $896.23. That's the expected value of the present value, and it's fair to call that the "real value" of each of X and Y today, and that would be a fair price to sell either X or Y for. I'd like to get some money right away, so I offer to sell you X for $896.23. You say, "That's a fair price, but it's a BB rated security, and I only buy securities rated A or above. The 5% default rate is too high for me, even though the price is fair." OK, so I have a problem. I'd like to sell X and Y, but many people won't buy such risky investments, even at a fair price that takes the risk into account. If EITHER X or Y pays out (does not default), then the owner of P will get $1000. P is the "high-rated tranche." If BOTH X and Y pay out, then the owner of Q will get $1000. Q is the "low-rated tranche." So now, P and Q are certificates that, like X and Y, each may pay $1000 a year from now, but because of the rules they have different probabilities of payout, and therefore different real values today. So the probability that EITHER X or Y will pay out is 1-(1-.95)*(1-.95) = 1-0.0025 = .9975 = 99.75%. So the probability that P will default is 0.25%, which gives it an A rating (which requires a default probability of 0.343% or lower). The magic has started: I've taken two BB rated securities, and created from them an A rated security. So P is A rated, so it meets your criteria for investing, and you'll now be willing to buy P for a fair price. I wanted to keep this example simple, so the rating comes out to A. If I manipulated the numbers a little differently, I could easily have gotten the rating to come out to AAA, which is what the financial engineers do in actual practice. What's the probability that Q will pay out $1000? That equals the probability that BOTH X and Y will pay out. That probability is 0.95*0.95 = 0.9025 = 90.25%. So the probability of default is 9.75%, and so Q is a CCC+ rated security. So the magic has a downside, as well. I started with two BB rated securities (X and Y), and ended up with two securities (P and Q) with different ratings, A and CCC+, respectively. There are some investors who are willing to purchase CCC+ securities, provided that they pay a fair price. Let's now compute what that fair price is. Fair value for P = $1000/1.06*(99.75%) = $941.04. Fair value for Q = $1000/1.06*(90.25%) = $851.42. ASSUMING THAT THERE ARE NO DEFAULTS, what are the interest rates earned by purchasers of P and Q at those prices? Those are damn high interest rates. So here's what I do. I tell you, "I'm going to sell you this A-rated security P for $943.40. At the end of a year, you'll receive $1000, which means you'll get 6% interest. That's a great deal!" First, I "forgot" to mention to you that the security P might default. In fact, I'll tell you that these things "are so safe that they NEVER default. You can count on it!!" If you don't understand structured finance -- and what investor does? -- then you won't even ask the right question. Second, I keep the difference as a commission. The fair price is $941.04, and I sell it to you for $943.40. So I keep the difference, or $2.36. You have no idea I've done this, because all you've seen is the price $943.40. Now, $2.36 might not seem like much, but in actual practice we'll be dealing with CDO security pools valued at a hundred million dollars in a single deal. That makes the commission $236,000 -- on a single deal! If I'm a good salesman and I put together a hundred of these deals a year, then I'll make tens of millions of dollars in commissions. If security P doesn't default, then you'll earn your 6% interest, and you should be happy. If you've bought millions of P's, then you'll probably have defaults in 0.25% of them. The nominal value of each of those P's is $943.40, which is what you paid for it. But when they start defaulting, then a lot of them will have to be "written down," based on the real volume of defaults. For example, if you have $10 million (nominal value) of these things in your portfolio, then you may have to write them down to $9.8 million, and take a $200,000 charge. That's bad enough, but now suppose that all the X's and Y's that were securitized into P and Q were "liar-loan" mortgages, approved for homeowners with no income, no assets, no job, and no chance of making the payments. Then the defaults will rise much higher, and you'll have to write down a lot more. Typical writedown amounts for Citibank and Merrill Lynch have been in the neighborhood of 20-40 cents on the dollar. So if you have $10 million (nominal value) of these things in your portfolio, then you'll have to write them down to $2-4 million. That's a financial disaster for you. But it's no problem at all for me, since I already have my commission, and I really don't give a f--k whether you've been screwed or not. What went wrong? Remember, a few paragraphs back, we said that the probability of payout from each of X and Y is 95%, and we assume that those are INDEPENDENT probabilities. Well, if X and Y are both related to subprime mortgages, then these probabilities are no longer independent, and so the computations come out wrong. I can easily sell it as a "junk bond" for the "fair price" of $851.42, because it pays 17.4% interest. I can use the same trick as with the high-rated security. Instead of giving you 17.4% interest, I'll raise the price so that you get only 10% interest, and I'll keep the difference as a commission. Since you have no idea I've done this, you'll think that I'm really giving you a deal with this huge 10% interest. I can pool a whole bunch of similar CCC+ securities and repeat all the steps in the example above, creating a new CDO from the junk securities in the last CDO. 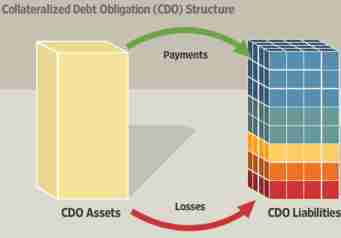 The result is called a "CDO-squared," because it's a CDO that backed by other CDOs. I can insure the low-rated security with a bond insuring agency, in order to bring its rating up to AAA. I'll discuss this option below. And so, I started out with X and Y, which would have given me a little money a year from now. I used a variety of "structured finance" tricks, I lie a little, I forget to mention some things, and so I get a lot more money, and I get it today rather than a year from now. You, the investor, get screwed, but I couldn't care less. Instead of just X and Y, there are hundreds of millions of dollars worth of securities used as input. Furthermore, the input securities are themselves at different ratings levels, and so the arithmetic of combining these becomes a lot more complicated. When there are multiple tranches, a "cascade rule" is put into effect, similar to how payments are made to P and Q in the above example: All the income is pooled, and the high-rated tranches are paid off first. Next, the middle-level tranches are paid off and, if there's enough income, the lower-rated tranches are paid. This "cascade rule" is very important, and we'll illustrate it later. But whatever the complexity of the "real world" CDO, it's based on exactly the same principles as illustrated by the above example, using the same kinds of computations for "present value" and "expected value." A December 27 page one article in the Wall Street Journal described the steps of how a particular CDO, a Merrill Lynch product called the "Norma CDO," was made. The online version of the article was accompanied by a flash graphic that shows interactively how it worked. Although the article requires a subscription, you can see the flash graphic without a subscription by clicking here. The flash graphic doesn't give too much explanation, and so the following should make it easier to understand. The graphics are screen shots from the flash graphic, which you should definitely look at for yourself. The individual mortgages are not the X's and Y's in the example above -- those come in the next step. These are the individual mortgages that are sliced and diced to get the X's and Y's. Several thousand loans go into a single pool, labeled "RBMS trust" in the adjoining diagram. In order to provide "diversity," different kinds of loans from all over the country are combined into this pool. That way, the investors are protected, since risk is spread around. These assumptions made sense in earlier decades, but in the last decade they were defeated for generational reasons, as we'll explain below. There's an important correction to this diagram: It isn't just "subprime mortgages" that go into the RMBS trust; it's all kinds of mortgages, many of which are liar loans -- approved for homeowners with no income, no assets, no jobs, and no hope of making the payments. The RMBS Trust is "securitized" -- sliced and diced into individual securities called "Residential Mortgage Back Securities," or RMBS. These securities are the X's and Y's that will form the CDO. In our example above, the X's and Y's had equal risk, both B-rated. In real world examples, the original mortgage loans that went into the RMBS Trust had various levels of risk, so when they're sliced and diced into RMBS securities, those securities have multiple levels of risk as well, and so have different ratings. These different levels are called "tranches." The AAA-rated securities are low-risk tranches, and the low-rated securities are high-risk tranches. Just as the X's and Y's could be sold as is, the RMBS bonds could be sold as is. Fair prices and interest rates could be computed for each rating level, and bonds at each level could be sold. However, in that case, there would be very few AAA-rated securities. Therefore, a "cascade rule" is set up. All the income for all the bonds goes into a pool, and the highest-rated bonds get paid off first. As more money comes in, the lower-rated bonds get paid off as well. If enough money comes in, then everyone gets paid, as we'll illustrate later. The low-rated bonds in the RMBS pool can't easily be sold because they're too risky, so the trick is to get them an AAA rating. The low-rated bonds are moved over into a new pool called a collateralized debt obligation (CDO). Although all these bonds were low-risk, they can still be sorted by risk within the low risk category. Then a "cascade rule" is put into effect for the CDO, just as it was for the RMBS, so that income is first paid to the highest rated bonds, and additional income is paid to the lower-rated bonds. 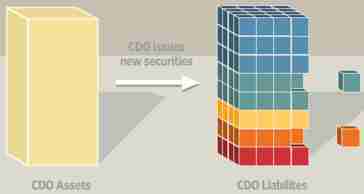 This CDO itself contains lower-rated securities, and those can be passed off to a new CDO, creating a "CDO-squared." There's no limit to the ingenuity that financial engineers can show, in order to collect fat commissions while screwing the investor. Income to the CDO goes to the high-rated bonds first, and liabilities are assigned to low-rated bonds first. That way, the high-rated bonds are more likely to be paid, while the low-rated bonds are more likely to default. When the CDO was created, most of the securities were AAA-rated. When the "credit crunch" began in August, 2007, ratings agencies were forced to reexamine their ratings of CDO securities, and hundreds of billions of dollars worth have already had their ratings lowered several notches, making many of them almost worthless. We've referenced this "cascade rule" several times in the explanations above. This is crucial to the workings of CDOs. Fortunately, Porfolio.com has put together a flash graphic that illustrates how income cascades from one tranche level to the next. It's really a VERY dramatic graphic, and you have to see it for yourself, which you can do by clicking here. 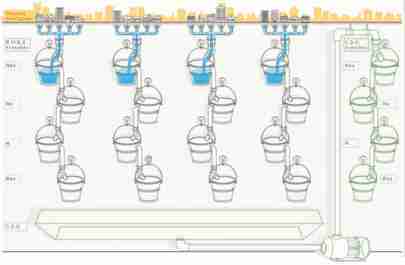 Relating this to the previous set of graphics, the rows of buckets on the left portion of this graphic represent the different tranches of the RMBS, while the buckets on the right portion represent the different tranches of the CDO. As income comes into the RMBS (where income is represented by the blue liquid filling up the buckets), the high-level tranches get paid first. 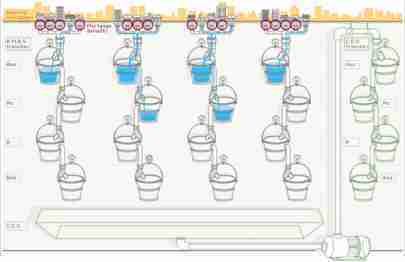 As more income comes in, the lower-level rows of buckets get paid. The bottom row of buckets corresponds to the low-rated RMBS bonds that were assigned to the CDO. 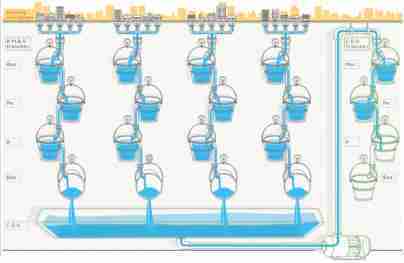 Therefore, all the blue liquid that reaches these buckets go into that big tray on the bottom - which represents income to the CDO. 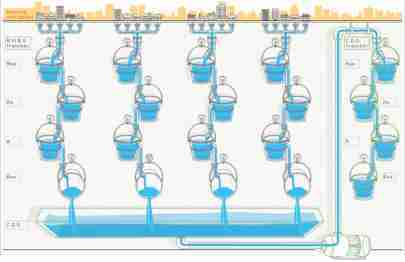 The income to the CDO (the blue liquid in the big tray) is then used to pay the top-level tranches of the CDO first. 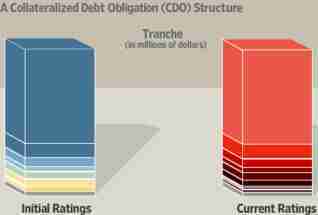 As more and more income (blue liquid) is paid to the CDO, all the tranches of the CDO get paid. This is the fantasy scenario, when virtually no mortgages default. Things start to go wrong when mortgages begin to default. In this diagram, defaulting mortgages are represented by red circles below some of the houses at the top of the diagram. When there are only a few defaults, then not all the RMBS buckets get filled at the lower levels. 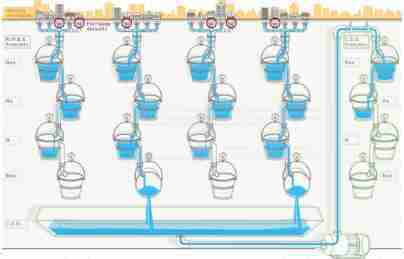 Therefore, less income gets paid to the CDO (less blue liquid pours into the big tray at the bottom). As a result, the upper tranches of the CDO get paid, but the lower tranches of the CDO don't get paid. In this diagram, there are lots of red circles, indicating lots of defaulting mortgages. Some of the medium level tranches of the RMBS don't get paid. But even worse, no income at all reaches the CDO, and so the CDO securities are completely worthless. This is what we're seeing a great deal of these days. Remember that the top levels of the CDO have AAA ratings, and payment is supposed to be certain. Everyone from corporations to city governments felt safe investing in these CDOs because of the AAA ratings, and now they're losing everything. 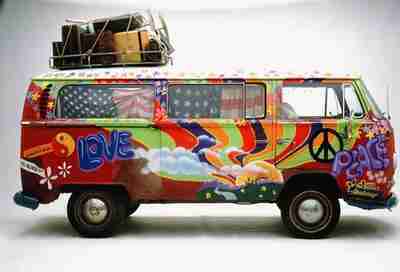 For some reason, ever since I first heard about Structured Investment Vehicles (SIVs), the thought that's popped into my mind was a 1960s style Volkswagen love bus, covered with graffiti. In fact, the comparison may be unfair to the love bus, because SIVs are less reliable. In the previous section, where I discussed how the "cascade rule" works for CDOs, it was apparent that things could go wrong, and CDOs could become completely worthless. That's what actually happened to many CDOs. When you read in the news that "Citibank is bringing these CDOs back onto their balance sheet," it means that the SIV failed, and Citibank has been forced by public pressure to take responsibility for what it's done. The instability of bond insurance is a growing danger to the world financial system today. Before going into the use of credit default swaps (CDSs), let's do the arithmetic of insurance. The three major bond insurers are ACA Capital Holdings Inc., MBIA Inc and Ambac Financial Group, As of this writing, all three appear close to collapse, and a lot of people are scrambling for a way to bail them out. Whether any bailout will succeed remains to be seen. The idea behind bond insurance is that if you want to sell a low-rated security, you insure it against default with a bond insurance agency. The investor in the security is thus "doubly protected" -- he can expect to receive payment either from the bond or, if the bond defaults, from the insurance agency. Presumably, the insurance agency itself has to have an AAA rating if it is to confer an AAA rating on a security that it insures. In fact, that isn't quite true. ACA has never been more than A-rated, although both Ambac and MBIA have AAA ratings. All three agencies' ratings are in doubt in the current growing crisis. But financial engineers haven't run out of magic yet. Let's see how an A-rated agency like ACA can magically confer an AAA rating on a low-rated security. An A-rated agency has a 0.304% probability of default. Suppose X is a BB rated bond. This means that it has an 5% probability of default. When X becomes insured, then the probability of default is 0.304%*5% = 0.0152% . This is considerably better than then 0.094% maximum probability of default necessary for an AAA rating. Therefore, X without insurance is BB rated, but with insurance it's AAA rated. In fact, an A rated agency can get the same result with even a CCC rated bond. The probability of default of such a bond, when insured, would be 0.304%*29.945% = 0.091%, which is just barely enough to get an AAA rating. Thus, even though ACA Capital Holdings itself had only an A rating, it had a considerable amount of power to confer AAA ratings on low-rating bonds. Sellers of low-rated bonds will be willing to pay fat fees to an insurance agency to confer the magic of an AAA rating on their low-rated securities, and that's what happened, until it all started falling apart in the last few weeks. Agencies like Ambac and MBIA, which have AAA ratings themselves, can confer an AAA rating to ANY security, no matter how low the ratings. This gives them an almost unmeasurable amount of power -- as long as they don't have to start paying off on all those defaults. If you're a homeowner and you want to insure your home, you purchase a homeowner's insurance policy from an insurance company. If you're an investment banker and you want to insure your latest and greatest CDO security, you purchase an insurance policy called a "credit default swap", or CDS, from a bond insurance company ... or anyone else who'll sell one to you. Anyone can buy a CDS. You cannot buy a homeowner's policy on a stranger's home. You cannot buy a life insurance policy on a stranger's life. But if you want to "bet" that one of General Motors' bonds is going to default, then you can purchase a CDS from a bond insurer, even if you don't own any actual GM bonds. Anyone can sell a CDS. Companies like Allstate and Met Life are recognized insurance agencies, and if you bought an "ordinary" insurance policy, you would buy it from a company like that. But almost anyone can sell a CDS -- including ordinary banks and hedge funds -- in addition to bond insurers like ACA, Ambac and MBIA. And so, a CDS is just a contract between any two parties -- a party and a counterparty. The seller of the CDS is betting that the underlying bond being insured WON'T default, while the buyer of the CDS is betting that the bond WILL default. The CDS contract itself is a security that can be sold. You wouldn't sell your homeowner's policy to someone else (which would mean that if your house burns down, then that person would get the insurance money). But there's nothing stopping you from selling a CDS. And, as the graphic points out, the closer the underlying bond comes to default, the more valuable the CDS becomes. As with everything else in structured finance, credit default swaps have been enormously abused. If you're a bond insurer or a hedge fund, you can make huge amounts of money by selling CDSs, demanding large fees in return for conferring the magic of an AAA rating. The problem arises when defaults start occurring, and the insurance policies have to be paid off. Right now, all three of the major bond insurers, ACA, Ambac and MBIA, are being forced to reexamine their entire portfolios -- and quickly, or they'll face bankruptcy. "With no central trade processing of credit-default swaps, defining trading-partner risks can be a Herculean task. Mr. Buffett learned the difficulty of unraveling such complex instruments in 2002 when he directed General Re Corp., a reinsurer that had been acquired by his Berkshire Hathaway Inc., to pull back from the business of these swaps and other derivatives. It took General Re four years to whittle the business from 23,218 contracts to 197 by the end of 2006. Doing so involved tracking down hundreds of counterparties to General Re's trades, many of which Mr. Buffett and his colleagues had never heard of, he says, including a bank in Finland and a small loan company in Japan, to name just two. One contract, Mr. Buffett says, was designed to run for 100 years. "We lost over $400 million on contracts that were supposedly" safe and properly priced, "and we did it in a leisurely way in a benign market," Mr. Buffett says. "If we had to unwind it in one month, who knows what would have happened?" If the experience of General Re carries over to the others, then Ambac, ACA and MBIA don't have a snowflake's chance in hell of surviving. On this web site, I'm always complaining that journalists, politicians, analysts and pundits interpret everything in terms of race or class, and are completely blind to a generational explanation, no matter how obvious it is. I've come to the conclusion that even the simplest generational concepts are too abstract for most people to understand. That's why, on this web site, I try to explain generational concepts at the simplest grade school level language. I don't always succeed, but I try. In this case, the generational explanation really is more abstract that it is in other cases, so let's try to take it step by step. When you're talking about things like "insurance risk" or "default risk," you want to spread the risk around as widely as possible. This is important from a mathematical point of view, because you want the probabilities of different loss events (e.g., bond defaults) to be completely independent of one another. All of the models and examples that we've been describing are based on this assumption. Mathematically, it means that if you want to get the probability of two loss events both occurring, then it equals the product of the probabilities of the occurrences of the individual loss events. If you don't understand the above paragraph, then go back and work through the numerical example again, and take particular note of the places were we multiplied two probabilities to get a joint probability. This step is absolutely crucial to all the examples and models, and requires that the events be independent of one another. Without this independence, the models fail, and in fact, that's why all the computer models that have been used financial engineers, ratings agencies, hedge funds, and bond insurers have failed. Let me repeat that: This lack of independence is the SPECIFIC REASON why all these mathematical and computer models have failed. For example, suppose you have a life insurance company or a homeowner's insurance company or a car insurance company. If the company insures homes in Texas and Montana, then a house burning down in Texas are almost certain to be independent of a house burning down in Montana. Or, a car accident in North Dakota is almost certain to be independent of a car accident in South Dakota. On the other hand, if a major hurricane strikes Louisiana, destroying many homes, cars and lives, then those events are not independent of one another, since they all come about from the same hurricane. The law of averages doesn't apply, since the loss events all come from the same source. An insurance company that operates only in Louisiana is liable to go bankrupt under those conditions. A larger insurance company, one that operates nationally in every state, will still have some protection from interdependent loss events. For example, for such a company, if a hurricane strikes Louisiana, causing many losses, those losses will be offset by the great weather in Kansas. The same large insurance company can protect itself from class and income based interdependent loss events the same way, by diversifying geographically. For example, if there are a lot of defaults among poor people in Mississippi, they'll be offset by low-risk loans to rich people in California. The above examples illustrate how an insurance company can use geographical diversity to overcome the danger of interdependent events based on things like geography, race, class, income, and so forth. By this diversification, the law of averages will still apply. But there's no way to (legally) diversify so that you can overcome interdependencies based on generations. Generations are ubiquitous. They go across every geographical division, every race division, every class division, and every income division. There is no protection against that. Generations are different from one another -- VERY different. This is almost always ignored, because people are embarassed to talk about it. There are HUGE differences in attitudes and behaviors between Boomers and Generation-X today, as I recently wrote about in "The nihilism and self-destructiveness of Generation X." In particular, the current crisis has come about because of the Nihilism of Generation-X, as I described in an article that I wrote in November, that shows the Boomer and Generation-X contributions to the credit and stock market bubbles. Even if you disagree with the details of that argument, nobody can disagree with the main point: That Boomers and Generation-X have TOTALLY DIFFERENT world views, and so generational changes that occur in neighborhoods, at management levels, etc., occur EVERYWHERE. The "Law of Averages" doesn't apply to these changes in behavior and attitudes, because the same thing is happening EVERYWHERE. For years now, I've been writing about the fact that mainstream macroeconomics has gotten NOTHING right, at least since 1995. That's because mainstream macroeconomics is obsessed with race, class and income restrictions that often turn out to be meaningless at the macro level. Why did the stock market bubble start in 1995, instead of 1990 or 2000? Mainstream economics is TOTALLY SILENT on that question. The only explanation is the generational explanation -- the bubble began when the survivors of the 1929 crash all disappeared, all at once. Why did the massively abusive use of structured credit begin around 2002? Mainstream economics provides no clue whatsoever. Generational theory has the only explanation, by relating it to the rise in Generation-X to middle management positions in financial firms. And of course, mainstream economics has absolutely no explanation for what's happening today. Various professors of economics and financial analysts are stumbling around in the dark, making one dumb prediction after another that turns out wrong, often within half an hour. This is the only web site IN THE WORLD that has gotten it right -- not only on the developing financial crisis, but on predictions of social, political and conflict changes around the world, in the Mideast, in Iraq, in Darfur, in Lebanon, in China, and recently in Burma and Kenya. The predictive success of this web site has been phenomenal since 2003. I've repeatedly challenged everyone to find any journalist, analyst or web site anywhere in the world that comes anywhere close to the predictive success of this web site, and none has been found since none exists. In 2006, I wrote an article, "System Dynamics and the Failure of Macroeconomics Theory," explaining exactly where mainstream theoretical macroeconomics goes completely wrong, and how it can be fixed. I've written a number of theoretical articles on macroeconomics since then, expanding those ideas and filling in details. 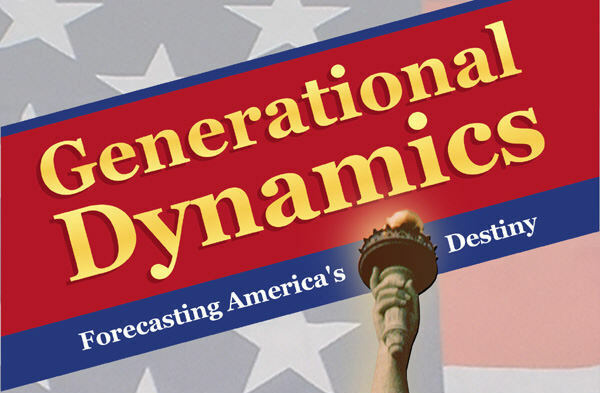 If there are any economics or macroeconomists or economics students out there reading this, and if you'd like to start getting things right, instead of just writing things that impress your friend but always turn out wrong, then you MUST start incorporating generational theory into macroeconomic theory. Nothing else works.